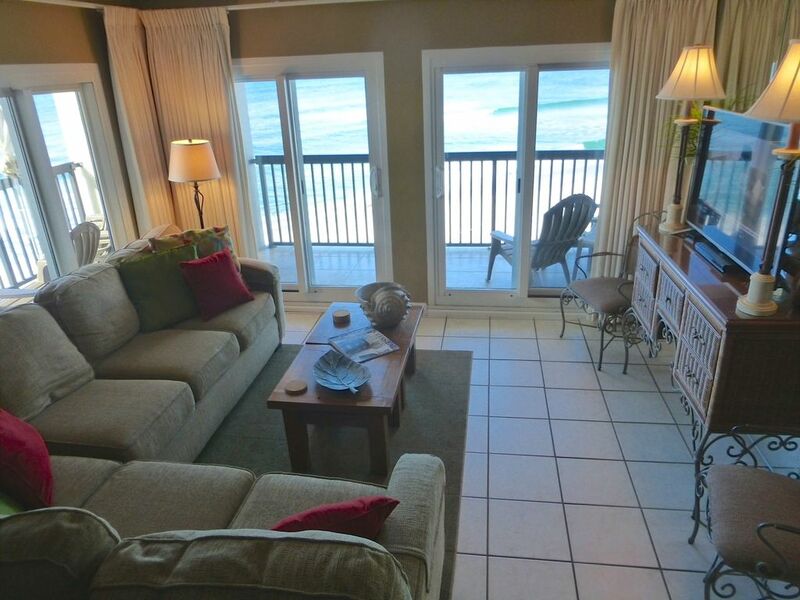 Beachfront Condo with Spectacular View and WiFi - Vacation in Style! Pinnacle Port Resort at Carillon Beach, is a private, upscale, gated, 26-acre resort, located on the emerald-green waters and the snow-white sands of the world's most beautiful beaches. Both a beach and lake resort, Pinnacle Port is bordered by both the Gulf of Mexico and 880-acre Lake Powell and is adjacent to Camp Helen State Park and the beachside community of Carillon Beach. This is 'Old Florida' at its best, the way it used to be with uncrowded beaches, shore wildlife, and and stretches of undeveloped sand. It is 22 miles east of Destin, ten miles east of Seaside, and three miles east of Rosemary Beach. Enjoy the amenities, shops and restaurants of 30A, just minutes away. Northwest Florida Beaches International Airport -ECP- (with service from Delta, United and Southwest Airlines) is located approximately 17 miles away in Panama City. Welcome to the ultimate beach destination! This third-floor, lovingly-cared-for condominium is beachfront and located in mid-rise building C2. Enjoy the sea breezes and spectacular views from the wrap-around balcony, just yards away from the Gulf! The beach is closer than you can imagine! A professional interior designer's personal getaway, this single-level condominium is comfortable, immaculate, and well appointed with all the extra touches. Each of the 3 bedrooms has king bed. The brand-new, fully-equipped kitchen features granite countertops and opens into the dining area and living room with tile floors throughout. The living room offers a flat screen Smart TV with Blu-ray player, and each bedroom has flat screen TVs, 2 with built-in DVD players. Cable is provided throughout. Bed linens and bath towels are included. (Bring your own beach towels). WiFi is provided in the condo and throughout Pinnacle Port! References happily provided upon request. Sorry, absolutely NO SMOKING and NO PETS. WEEKLY rentals only with Saturday change-over days. Pinnacle Port Resort offers two pools (one indoor/outdoor, heated seasonally), saunas, four lighted tennis courts, exercise facility, shuffleboard, playground, barbecue grills, boat ramp, boat slips, and dock for fishing on Lake Powell, private streets for biking and walking, and beach service rentals. Gated security entrance and 24-hour security patrols are provided. Free wireless internet is available inside our condo and throughout Pinnacle Port. Check office for summer schedule of movies by the pool. Enjoy the shops, restaurants, concerts on the lawn, and church services offered by Downtown Carillon Beach, all within the gate. Additional restaurants, shopping, supermarket, golf, fishing, and other attractions are just minutes away. Pier Park, Florida's newest and best shopping and entertainment complex is located just 7 miles from Pinnacle Port. This beautifully designed outdoor shopping mall features national retailers along with unique boutiques, restaurants, and a 16-theater movieplex. We stay busy with our interior design business in Memphis, TN but love spending time at the beach! No matter where we travel, we still consider this beach to be the most beautiful in the world! There is nothing on the beach like Pinnacle Port! The view of the beach from our balcony is breath-taking! We are so close to both the Gulf and Lake Powell, and yet so private, situated between a state-owned bird sanctuary and an upscale residential neighborhood. Being located in a gated community with security, set back from busy Hwy. 98 means hardly any traffic on our quiet streets. Spectacular view of the beach and Gulf from our balcony! Freshly remodeled kitchen with granite countertops and new appliances! Wi-Fi in our condo!!! Bathroom towels provided. Please bring your own beach towels. All TV's are new flat-screens. Living Room has Smart TV for Netflix, Amazon Prime, etc. streaming services. Blu-ray player in living room. DVD players in 2 bedrooms. Bocce ball courts, shuffleboard courts, basketball courts on premises. Rentals available at Shipwreck Island in Downtown Carillon Beach. In addition, many area bicycle rental companies deliver. Pinnacle Port has 2 pools. The Indoor/outdoor is seasonally heated. I took my husband, Aunt, Mother and 17 year old son to the beach. My son loved to be with his friends in Seaside but it is tooooo congested and busy for us. We opted to be at the end of 30A and it was the best decision ever! This was a private gated community with all the amenities you could ask for. The beach allowed us plenty of room for our set up and space from next group. All the families we met were nice as could be. The beach was clean and it was next to Camp Helen State Park so no one came from the West to use beach area. The actual Condo could not have had a better location with the wrap around deck you could see the entire beach and watch the sun sets!! Oh and the dolphin show daily from the balcony! We always worry about the beds on vacation. But no worries here! They had a great firm mattresses with good pillows. A must for a chronic bad back. The kitchen was well appointed and had all the cookware I needed, as I love to get fresh seafood nightly and create! You do need to bring your own spices though, there was only salt and pepper. We would defiantly rent here again! A gem if you love a peaceful, calm and very comfortable stay at an affordable price. We will definitely consider this condo for our next stay! It was a wonderful family vacation! I carried my daughter, grandsons and my 89 year old mother. The condo has easy access. Very roomy with 3 king beds. Beautifully decorated. Well stocked. Loved the wrap around balcony ! Great overall experience! Thank you! So happy you enjoyed your visit to our condo! We hope you'll come again! Beautiful view! Beds are very comfortable and kitchen well stocked. Owner was wonderful and very accommodating. Will be looking forward staying again. Condo was perfect for our family of 5. The third bathroom was great and the view from the condo was beautiful. The only concern I had is that the large pool at the tower had not been opened yet for the season which we found strange. Obviously, this is not the owner of the condos issue but it would have been nice to know it was not going to be open. We hope to come back and rent this unit again. There were five sisters all from different states and our 94 year old mother who rented Mickie and Steve’s beautiful and spacious condo. Location, Location, Location! Third floor condo with a balcony on two sides that looked onto the emerald-colored Gulf. The elevator was very handy and the walk to the beach took less than a minute. Will was the beach chair and umbrella rental guy, who was so friendly and accommodating. The sunsets and moon-lit walks on the beach were outstanding. The local dolphins kept us entertained and the passing of what they think was a whale shark was exciting. The condo was clean with new towels and bedding, as well as a generously-stocked, newly remodeled kitchen. Never heard the neighbors. It was quiet except for the soothing sound of the crashing waves. Pinnacle Port had all the equipment to enjoy shuffleboard, bocce ball, tennis, basketball, kayaking, etc. The resort pools were clean and refreshing. Everyone was so friendly. Our bike ride from Rosemary Beach to Seaside was a nice change from basking in the sun. Thank you again Mickie for helping to make this reunion with a mom and her five daughters so memorable. Our visit was way too short and we plan to return. Great location , away from the crowds on the quite end of Panama City. Really nice codo with plenty of room for 6 adults. Two king beds which is great. Recently remolded kitchen was awesome. Breath taking gulf views from balcony. Close to stores and restaurants but far from the crowded PCB strip traffic and noise. Owner was very friendly and easy to work with. Highly recommended , looking forward to returning.